The original plan for this Sunday was to head back to the hills of the old Melrose Half Marathon route. For those that haven’t forgiven me for that route yet, I have good news. I’ve switched the week 4 and week 7 routes so this week we run Horn Pond instead of Spot Pond! (That means we do Spot Pond in 3 weeks though). This week run will start at 8AM at Brueggers and head out Wyoming past Spot Pond, the Stone Zoo (watch for the wolves) and down past Friendly’s. Follow North Border Rd (the muchÂ flatter relative to South Border Rd of the route you would have been running if not for the last minute switch) past the on ramp to I93N onto Park St. At the set lights turn left onto Marble St and run over I93 to the first water stop. The next section of the run will take you down Forest St to the Gingerbread Construction Company. Forego the tasty muffin and turn left on Washington St and a right (I think there are lights here now) onto Cross St. This street will bring us to Woburn where a right onto Main St (RTE38) and a quick left onto Lake Ave will bring us to the next water stop at Horn Pond. Horn Pond is a nice little 2 mile loop. There are a few extra paths that can be used to add on miles. One side route will take you past Woburn Country Club where Jimmy the Bartender has been spotted. Another common sight at Spot Pond is the Muscle Guy, an over developed specimen of a man that runs shirtless around the pond and the waving guy that directs foot traffic around the pond. Extra scavenger hunt points if you spot any of these people. Also not the planet markers along the last stretch of the pond. After almost a complete loop of the pond the route turns left on Lake Ave and heads back the way we came to water stop 1. Some runners opt to complete the loop of the pond since that adds another stop at the Horn Pond parking lot water stop, but that also adds a few more steps to your run. After climbing back up Forest St to water stop 1, the route will return to Brueggers via Franklin St. Instead of turning back onto Park St the way we came, continue straight. Go through the lights at Main St in Stoneham, past lights at Pond St, to lights at Franklin. Turn right onto Franklin and search out shade on your way past Stoneham High School into Main. Be prepared for a hot and sunny final stretch as you turn onto Main and head back to Brueggers. SHORT ROUTE RUNNERS: You have an option this week. You can either follow the prescribed route which runs out to water stop 1 with the long route runners and returns to Brueggers by way of Franklin St or you can start later at Water Stop 1 and run the more scenic middle part of the run with the long runners. You get 7 miles in either way. For those planning a distance between the long and short route, you can chop 3 miles off your run by starting or stopping at the first water stop. This will also give Barry a car to stash supplies in when he moves over to support us at Spot Pond. Let us know if you plan at parking at water stop 1. I also suggest if many people plan on starting/stopping there, carpool over, it is a small residential side street and we don’t want to annoy them by parking many cars on their street. Now that you know what we’re doing, are you in?! Roll Call! Who’s planning on doing what Sunday Morning? At 8 AM Barry moved a crowd of over 30 runners out on to Main St and announced the route and identified the water stops, preparing the large pack for the long run. When he was done the group mulled around chit chatting waiting for something… the word “GO!”. It seems a group of runners will stay at rest until that magic word is uttered. Once we figured that out we were off. A long line of runners quickly stretched out with Erin (from Marathon Sports) at the head of the line. It was another hot run, temperatures in the high 80s, low 90s, but a swirling breeze kept the dryer air moving. Most of the three mile stretch to the first water stop was spent in the sun. Along the way it dawned on each runner at some point that a shady cooler side of the street was right next to us if we only crossed the street. This wasn’t crucial knowledge at the time, but it would be a key factor as the sun got higher in the sky and hotter on the skin. Barry’s water stop at Nick’s Pizza in Wakefield was the turn around point for the shorter route runners. We had a good group of non-marathon training runners turning back there. Along with them a handful of longer route runners that raced The Blessing of the Fleet 10 miler two days before or that would race the Yankee Homecoming 10 miler two days later, all opting to keep the distance a little shorter on Sunday. The rest of us headed further north to the lake for a loop around. I found myself in a pack with Kristen, Ginny, JohnL, Billy, and Carol. Hugging the right side of the street for the shade we kept cool along the east side of the lake. Ginny talked of the magnitude of this run for her. With her eyes on a possible marathon in the fall, this run was her “Decision” run. There would be no live ESPN show with Jim Gray at the finish, but if she made it through this run without issue she would announce “The Decision” for her fall marathon. I trailed back behind the pack as we made our way around the top of the lake. The pack opted to go around the Converse building instead of falling the shorter walking path along the shore of the lake. I was planning on the shorter route, but seeing the pack take the longer way, and realizing that I would probably end up in front of them if I took the shortcut, I decided to avoid the taunting I would surely receive when the passed me and followed suit around the building. I regretted my decision as each step away from the lake seemed hotter and less breezy as I fell further and further behind the pack. (As a side note, I was one of the runners that ran the Blessing of the Fleet 2 days prior and I was feeling it). As I turned onto North Ave I spotted Nick coming the other way. For those new to the SLR, there is a term for running a slight variation of the route everyone else is doing, it is called “Nicking the Route” after Nick who is often seen running “with us” in the opposite direction. After passing Nick I ran North Ave watching my former pack fade further into the distance. Leaving the lake I had lost sight of all of them but Carol. One note from the loop around the lake that I didn’t witness: Jose, DaveH and AJ were behind me at the lake and its been reported that Jose had found his own method of beating the heat by creating an extra water stop. This water however was not drinking water, it was swimming water. For the first time on an SLR one of our runners ran into a body of water. Jose took a dip in Lake Quannapowitt (I’m not sure that’s legal so if it isn’t I’m making this up). I always thought there would be a day one of us went for a swim on a run, but I imagined it would happen at Breakheart. At the final water stop I had decided to call it a day and planned on hitching a ride with Barry back to Brueggers. The pack I once ran with took off as soon as I arrived, although Carol lingered behind with me. A cool cup of gatorade and water coupled with a mini-snickers reinvigorated me and soon Carol and I were off tackling the last 3 mile stretch along Main. I hear earlier SueC had considered a dip in the Murphy’s pool as she made her way back to Melrose, but obviously she wasn’t as desperately hot as Jose. Back at Brueggers a sweaty healthy crowd mingled and lingered through the morning. With another satisfying long run under our belt we cooled off and awaited the big announcement: “The Decision”! Would Ginny be bringing her running talents to South Beach with Lebron? Or Baystate? Or would she take the season off? Her answer… “I don’t know” More indecisive than Lebron I guess we need to tune into part II of “The Decision” next week! I assume there was at least one runner last week that uttered some choice phrases about the hills we tackled on the run. This week we recover from that with as flat a route you’ll find in the Melrose area. We’ll head up Main St to Wakefield. Barry will have a water stop ready at Mile 3, in the parking lot of Nick’s Pizza (next to the Dunkin Donuts). While the half route runners turn around and head back, the full route runners will loop Lake Quannapowitt first, then run back Main St. Simple as that! Week 2 – Another Hot One! 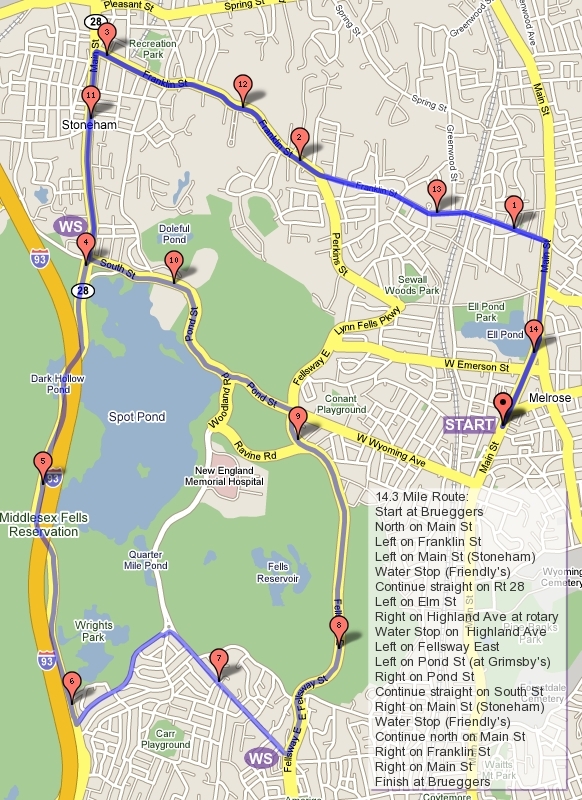 This week’s route is a staple of the Sunday Long Run. Based on the Melrose Half Marathon, the race that ultimately grew into Boston’s Run to Remember, we’ll be retracing most of the hilly half’s route. The first mile is nice and flat out West Wyoming to Grimsby’s. A left turn there introduces us to the hills of the Fellsway East. One large hill that never seems to end will end, then you’ll notice its little brother right behind it. For every uphill there is a downhill though, and the downhill sends you flying through a set of lights at East Border Road and down to the rotary at Highland Ave in Malden. You’ll take a right onto Highland Ave and slowly make your way up to water stop 1 just before you make it to Spot Pond. Barry will be hydrating you back up and sending you out for more. It’ll be a hot one so make sure to drink up! Full route runners will turn left at the rotary at McSheffrey’s Mobil gas station and complete a full loop of Spot Pond. Half route runners will stay to the right of the rotary and run the east side of the pond to Pond St back down a steep hill to Grimsby’s. Here they have a choice, turn left onto the Fellsway for the 7.1 miles or continue straight down W. Wyoming chopping off a mile of their route making it 6.1. Be smart, if its hot don’t push it! Meanwhile back on the long route we’ll be pushing through this hills on the west side of the pond. If we can have someone set up at the Straw Point parking lot (the cut through by Friendly’s and the Mobil Station) we can get another water stop in there too.Â Finishing the loop of the pond will bring us by the Stone Zoo, along winding paths up to Flynn Rink, and back to Barry’s water stop. After that a quick left on East Border Rd will climb back to the Fellsway East and a few more hills will bring us back to Grimsby’s. Any long runners who have had enough can turn right down Wyoming retracing the start of the route for an 11.5 mile run while the die hards continue up the Lynn Fells for one more hill! Passing Melrose High School and turning up Melrose St to Main St will bring you in along what promises to be a scorching last half mile back to Brueggers! That’s the route for tomorrow. Barry has the main water stop covered. I need one volunteer to park at Straw Point for an extra stop due to the heat. I believe Barry will pick you up there around 7:45 and bring you to Brueggers. A hot Saturday morning kicked off the Sunday Long Runs for the fall of 2010. In order to keep our Summer Party activities from being dented by our running, we pushed the run up one day. Although this did create some conflicts with some runners we still had well over 20 show up for the run. At 8AM, with the sun shining and humidity hanging in the warm air the first steps towards fall races were taken up Main St to the Lynn Fells Parkway. Heading east into the sunshine Jen, Judi, Katie, Mary, Joe, and BrianG lead the way. Slightly behind was BarryC and a troupe of the wounded spring runners, Michelle, Carol, and Lauren, along with some newer faces to the Sunday Long Run, Kristen and Beth. Rounding out the long runners were Dorota, Catherine, AJ, and Jose. As this group headed up Main St in Saugus towards Farm St in Wakefield, our half marathon crew took a sharp U-Turn and headed back Howard St. The smaller crew, made up of MaryAnne, AudreyH, Matt, Diana, and Ann, stopped for a quick sip of water at one of our extra water stops. Due to the heat and heavy humidity everyone needed all the water they could get. As they moved on from the stop, past the man dressed in a cow costume at a Howard St yard sale, and back towards Main St to finish up there run, I took off to Wakefield HS to meet up with Barry at the real water stop. On my way I passed all the runners as they shuffled along the sun drenched hills. The lead pack formed a cluster and tried to trigger the school zone traffic radar sign before getting to the water stop. Their cluster was not in a tight enough formation though, so their sprint did not get recorded, therefore the SLR radar record still stands at 13MPH set by Mary, Wayne, and me (Jim). At the water stop BarryP served up cool beverages and melted Snickers bars to red faced sweaty runners. After watching the condition of the first few groups come in I decided to cut across Nahant to catch the front runners for another extra water stop along the route. As the looped around, Lauren followed my shortcut by foot. Having seen her struggles to get back from her Boston training injury I’d rather see her taking shortcuts over not seeing her run at all. In the end she beat out Catherine who showed up having taken the same short cut, but she did it in the passenger seat of BarryP’s car. Not quite “a Lamberti”, defined as offering to drive the last water stop car back to Brueggers as if Nick’s doing you a favor,Â a Kane was stopping at 2 consecutive water stops without running a step, then continuing on. Catherine refueled a second time and jumped back in with Dorota to run the last 3 miles of the route. With a few modifications to the run, all understandable due to the weather (I didn’t run at all so who am I to judge) each runner made it back to Brueggers in one piece. Some (Katie, Judi, anyone else?) continued on further to throw some more miles on top of the 8.8. A job well done by all. A run like this will make you appreciate the cool fall temperatures you’ll be racing in in just a few short months. Welcome back everyone. On to week 2….